Although BioWare has been releasing games for over a decade, their latest is no less than a role-playing tour de force -- it’s a testament to a developer in top form, and Mass Effect as a whole pens a significant chapter in the science fiction bible. Mass Effect is also -- on its maiden voyage -- one of the most fully-realized game universes ever conceived; and the encyclopedic amount of knowledge gained throughout the course of this adventure would be enough to completely outstrip the Star Wars universe, if the Star Wars universe didn’t already have 30 convoluted years’ worth of hit-or-miss material spun into it. Comparisons to Star Wars are pedestrian, I know, but let’s not ignore the elephant in the room. BioWare is the corporation that re-envisioned Eastern mythology for the Western Hemisphere in Jade Empire, and similarly re-envisioned Star Wars mythology in Knights of the Old Republic for those that needed some more meat out of the venerable George Lucas license. 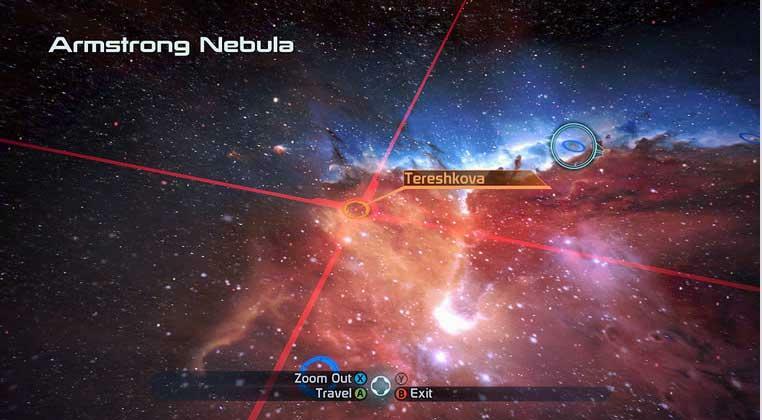 Mass Effect is likewise a bold match for Star Trek as well, as the technical jargon and astronomy-junkie concepts fearlessly tread erudite ground (without resorting to everything just being an “anomaly”). It also boldly goes where Star Trek has gone before by putting xenophobia and multiculturalism into a Petri dish and under a microscope. Purchasing the strategy guide cleanly maps out equipment and ability charts, but an annual subscription to Scientific American would’ve been just as effective of a primer for your role as the multi-tasking Captain/Navigator/Special Forces Officer, Commander Shepard. And there are a solid handful of character classes you can build around your particular version of Commander Shepard, all aligning on a triangle. The acute points of the triangle form the Soldier, a combat specialist; the Engineer, a tech specialist; and the Adept, a biotic specialist. “Biotic” is Mass Effect’s word for the Force, or more generally, psychokinesis. The dual-classed connecting lines of this class triangle are formed by the Infiltrator (Combat/Tech), Sentinel (Biotic/Tech), and Vanguard (Biotic/Combat). 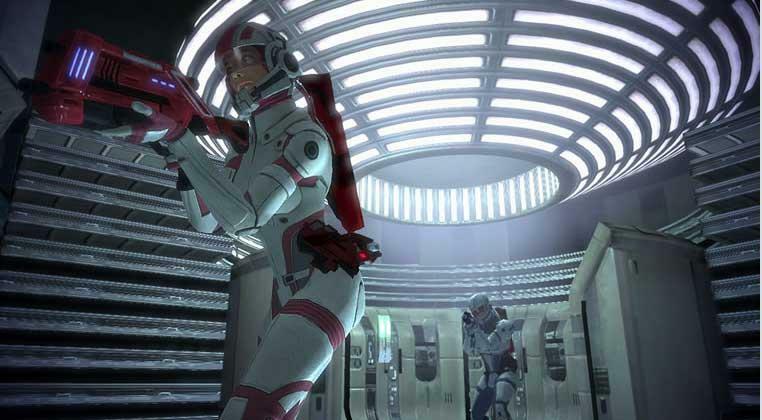 But no matter your specialty, Commander Shepard enlists a savvy crew that’ll balance the away team. The chiseled, buzz-cut, soldierly Shepard is the poster boy for Mass Effect, but a player can select from a mish-mash of faces and story-relevant backgrounds. Being a woman is as equally relevant (or irrelevant, rather) to the story as is the manufactured, alpha male hero. 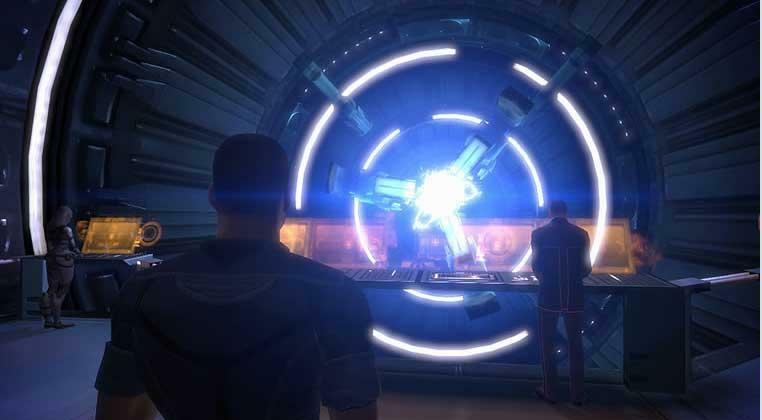 Once generated, the game’s crux is introduced early to Commander Shepard: Conversation. Mass Effect does for conversation what Assassin’s Creed does for platforming: It simplifies the user’s inputs while empowering the user’s affect on the surrounding terrain; and trust me, the conversational “terrain” in Mass Effect will peak and valley into some of the most beautifully-sculpted and vertigo-inducing topography ever traversed in a video game landscape. 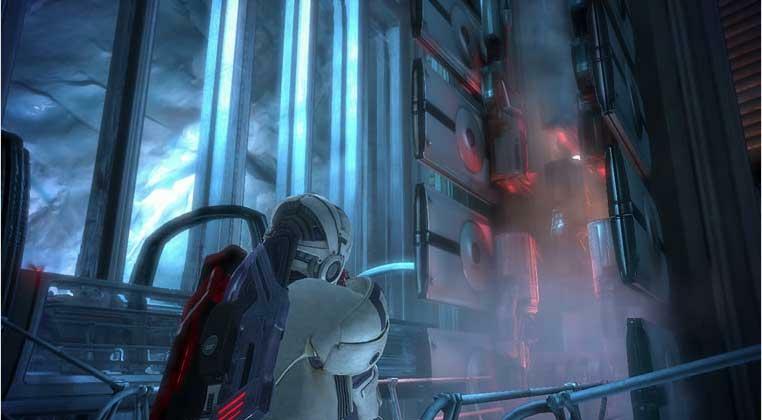 By trimming the fat from typically verbatim dialogue trees, Shepard is given general options to push or pull the conversation in one direction or the other without having to hear a voice actor repeat the lines a player just read for themselves. On the flipside, it also doesn’t oversimplify to the point where simply choosing “snarky” or “nice” is sufficient player input (although the Bard’s Tale is the simpler spiritual predecessor to Mass Effect’s similarly brilliant implementation of in-game talky-talk). The branching conversations, however, aren’t just caricatured paths between good vs. evil. Commander Shepard does have a mission to accomplish by day’s end; but it’s the getting there that counts. 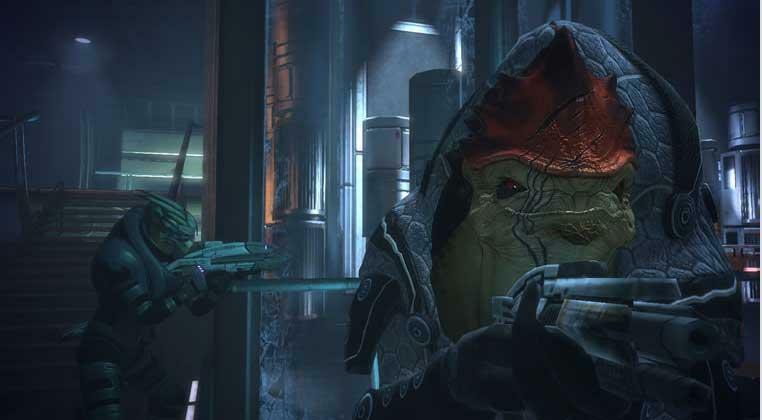 Whether known for his benevolence and charity, or by the trail of dead, a player will have a unique connection with not only Commander Shepard, but with the crewmates that hold him in awe, or regard him with fear. The toughest decisions -- and there are certainly more than a few earth-shattering, no-joke, past-the-point-of-no-return decisions Shepard must make -- can carry even the most pregnant pause to full term. The writers procured the type of painful conundrums that monster in complexity until you either resign to your gut reaction … or you drown in second guesses. Completely succumbing to one or the other won’t save you. Or the galaxy. No single game I’ve played in recent memory has taxed my mental faculties as much as Mass Effect. Not in a way that Sudoku or Rubik’s Cubes are taxing. Mass Effect appeals to you logically. It appeals to you emotionally. It taps into your id, ego, and super-ego until a mental picture of yourself, the player, begins to burn into the game screen. 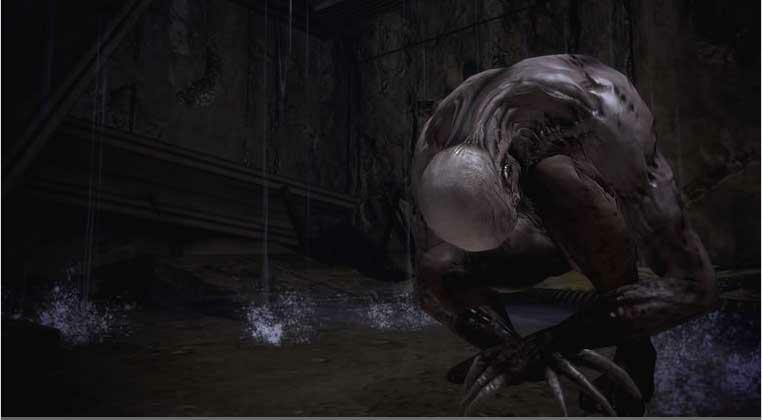 Yes, there are those gamer-types that invariably play the Paragon, or invariably play the Renegade (no matter what game their playing), but the massive effect this title could have on a player is that it will force them to interrogate the staid meta-thinking that many players typically rely on in order to complete a video game. This game doesn’t just add a nanosuit that shoots you with a low-grade adrenaline rush during some alien firefight -- it will introduce situational riddles and “ethical parables” (sorry, Tabula Rasa, but BioWare does it better) to light up normally dormant sectors of your brain pan. Mass Effect isn’t immune to the side effects of building a new gaming property from the ground up. There are stuttering frame rates during combat sequences that were never meant to turn into toe-to-toe warfare. There are ways to accidentally leave companions behind doorways that only open for Commander Shepard. And some of the inventory screens are overly-Spartan in presentation. But turning this into that kind of picnic completely misses the point, and, as BioWare themselves see it (and it’s a fair perspective that they hold), this grand opening is simply a solid cornerstone to build from. And if the size of this cornerstone is any indication, BioWare isn’t stopping until they’ve reconstructed the Tower of Babel. Role-players, put your lighters up in the air. This is every bit the sci-fi rock concert it was meant to be, with an unbeatable cast, an impenetrable storyline, and an undeniable gravity making Mass Effect impossible to escape.